Hippolyte Flandrin (Born 1809) was a French painter of the 19th-century. He was the 2nd of 3 sons, all of whom were also painters. His older brother, Augusto, spent most of his life as a professor at Lyon where he later died. His younger brother, Paul, was also a painter. He painted religious imagery and portraits. Flandrin showed interest in the arts from an early age, and he was looking forward to be a full time painter. However, his parents put a lot of pressure on him to become a businessman, and since he had very little training, he was forced instead to become a miniature painter. Flandrin and his brother Paul spent some time at Lyon, save for the time they left for Paris in 1829 and studied under Louis Hersent. The two brothers eventually settled in the studio of Dominique Ingres. Dominique became their friend for life and was also their instructor. 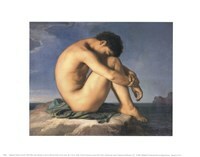 Flandrin struggled as a poor artist at first but he won the Prix de Rome in 1832. 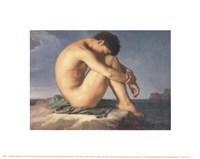 This was for his piece titled “Recognition of Theseus by his Father.” This was a very big achievement since the prestigious art scholarship meant that Flandrin was no longer limited by his poverty. The scholarship allowed him to study in Rome for 5 years. And while there, he created several paintings, which raised his status both in France and Italy. Flandrin returned to Paris in 1856 and received a commission in the church of St Séverin from the chapel of St John. This made his reputation to become even more impressive, and guaranteed him continuous employment for the rest of his life.